As promised last week, here's what I bought whilst in Milan, plus something from Bellagio, a charming little place within Como (a province in Italy, with a gorgeous lake). When I spotted Bershka in Corso Vittorio Emanuele, I ran for it (no kidding, I actually did). Thank goodness for block heels and flat pavements. The store was massive and I probably would not have found my way out if I didn't have a checklist of pieces my wardrobe needed. Even then, it still took some time to figure out which ones from my list I wanted to buy from here. This is where my ever helpful mum came in. After searching half the store for me, she showed me this particular pair of imitation leather shorts. I just about fell in love with it at first sight (the checklist? Well, I did note down shorts..although it was meant to be tailored). This wrap skirt is the inspiration for my Tartan Skirt DIY. I grabbed this as soon as I walked into Mango, it was literally a beeline. I was skeptical about the fit around the waist as the skirts from stores like Mango and Zara, tend to gape at the back for me. Thankfully, it fitted like a charm. It's so versatile and I can dress it up with a vintage lace top or down with a simple tee. Apparently the skirt's sold out on their site, so I''m glad I bagged it in person. The asymmetrical hemline adds an attractive feature and the angle slims down the legs. You have to wear a pair of lingerie shorts like these underneath though, to avoid any VPLs. After almost a couple of months coveting Angelina Jolie's BAFTA heels, I finally got a pair of courts in black leather (come on, you have to get at least one leather item from Italy), from H&M. Although I would have loved to have gotten a pair of Italian leather shoes, these were made in India (still exotic, none the less). I had just about given up looking for leather heels like these, until I walked into H&M. My eyes just zoned in automatically when I saw these. I am so glad I didn't slim down my specifications of; real non-patent leather, pointed heel, comfortable height and a good price. You saw that €N/A? Yeah, well I'm not telling. It's a secret. Let's just leave it at the fact that I bought it in Milan. The size is slightly too big to sit on my waist, so it rests on my hips. The belt loops make it possible to bring it up to my waist with a belt. 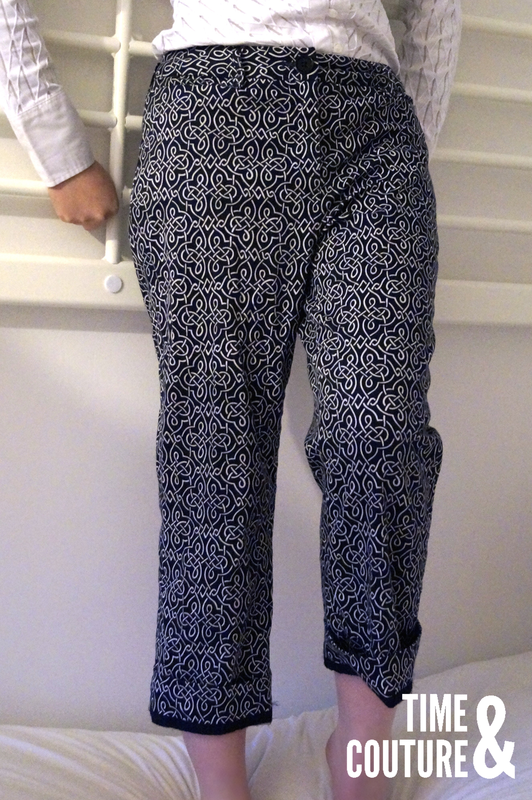 I love the pattern and deep blue colour of the trousers. I have actually folded the hems up in the photo, the strip of navy blue is actually the binding of the hems. I was even more convinced to buy this, when a lady next to me said "molto bene" repeatedly (nope she wasn't the shop owner. P.S. Molto bene in English is "very good"). I have worn this multiple times already, craving its presence when it's in the wash. My favourite outfit with this is with a crop top, heels and a blazer (cue the compliments). This has to be one of the coolest bags around. At 45 Euros, even better. This was the "something" I bought from Bellagio. 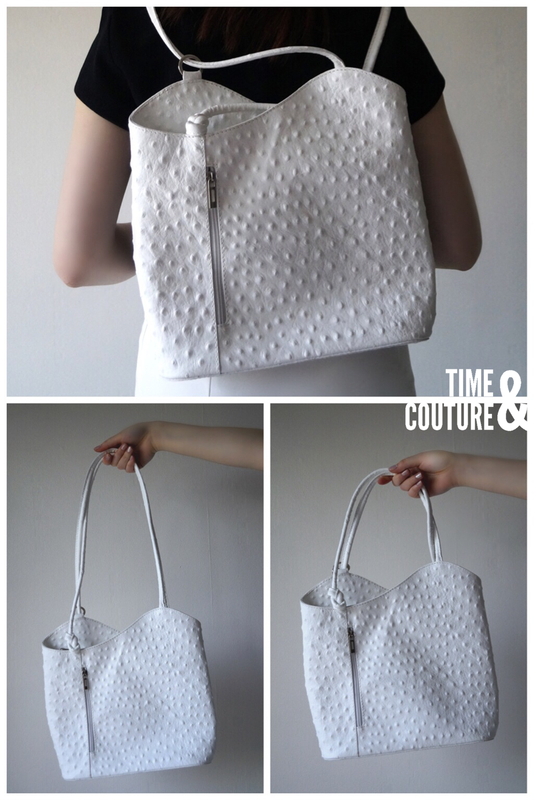 It trumps a lot of the bags I already own, because as you can see, it can transform from a backpack into a tote and then a handbag. It basically eliminates the need for two other types of bags. You can only see one ring from the pictures but, there are four metal rings that the handles can detach and attach to, to determine the length. This was from a little boutique (the shop owner claimed to have designed it herself), so I have had trouble finding similar styles online. Better luck finding it in Italy yourself. There were a selection of colours and textures, I narrowed it down to choosing between a smooth tan leather version and this hand-stamped ostrich leather effect on cow leather. I wanted white because it felt more me and it just looked intriguing (that and my minimalistic craze). So that's it! Hope you enjoyed having a look at my Italian Haul. I'm planning another one with everything else I bought during the Spring, so watch this space (well not just this particular bit of space surrounding "space").